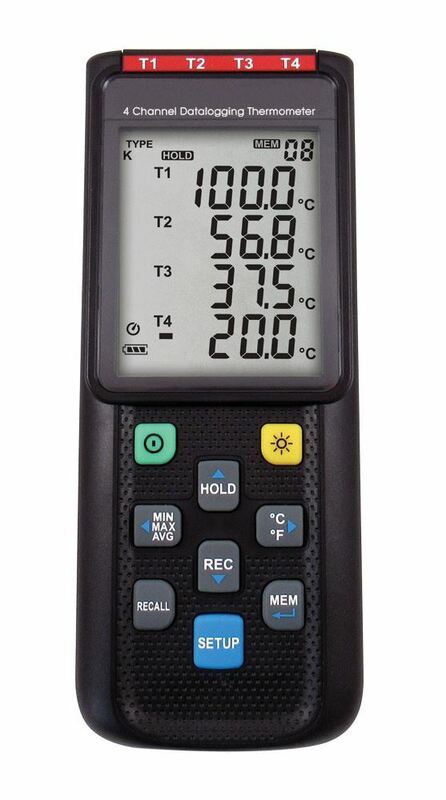 4-Channel Data Logging Thermometer - Gilson Co.
MA-324 4-Channel Data Logging Thermometer records and stores data for temperatures ranging from -328°—2,498°F (-200°—1,370° C). Models display data from four probes simultaneously on a multi-line backlit LCD screen in °C or °F using standard Type J, K, E, and T Thermocouples. The automatic shut-off feature preserves battery life. Auto-ranging, Max/Min, hi-lo alarms, and data hold features offer hassle-free temperature determinations. 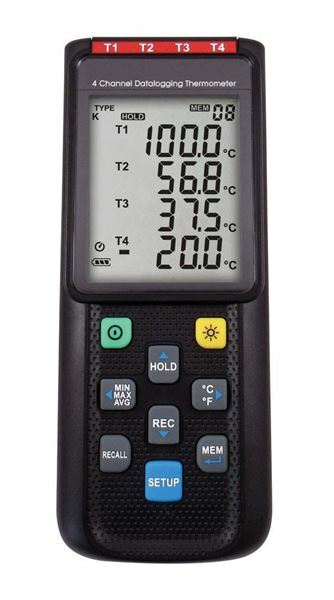 This thermometer has 99 memories which can store up to 16,000 data points for downloading to a PC using the included USB cable and downloadable software. Accuracy is ±0.5% of reading + 1°C or 2°F, full scale. The suffix “C” added to model numbers specifies units with NIST Traceable Certification. Backlit LCD screen provides readings in °C or °F. MAA-228 Water-Resistant Thermometer Pouch, vinyl for protecting the unit from dust, moisture, etc. Models: HM-620, HM-621, HM-622, HM-626*Curing Tanks are oversized and must ship via motor freight.